Lilongwe (Agenzia Fides) – “We are here to stand with you to fulfill our duty to help those in need” said His Excellence Monsignor Thomas Luke Msusa, Archbishop of Blantyre and President of the Catholic Bishops’ Conference of Malawi (ECM), during an ECM delegation visit of victims of the floods caused by cyclone IDAI in March. 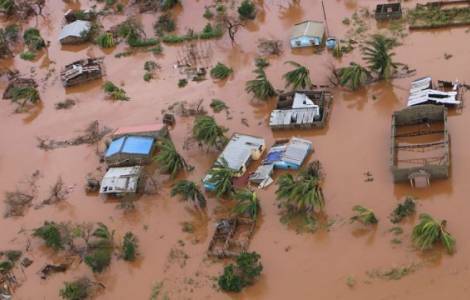 Thanks to the resources already available, the Bishops Conference through the Catholic Development Commission (CADECOM) will build 450 houses, 150 for each of the districts hit hardest by the floods: Zomba, Chikwawa and Phalombe. As part of the project the plan is to supply potable water through the drilling of local wells.